These conveyors, removing scrap from a press at Cannon Automotive, Bowling Green, KY, comprise part of an automated scrap-handling setup that serves four presses and ensures no press downtime due to scrap backup. to boost operational efficiency routinely investigate the fine points of the latest presses, parts-handling equipment and software. Less frequently does scrap-handling technology garner that same level of attention, but that is changing as companies realize that efficient scrap handling is an integral part of efficient production. Consider, for example, Cannon Automotive, Windsor, Ontario, Canada, a provider of just-in-time stampings and subassemblies for automotive and appliance industries. What’s true at Cannon Automotive can be true in any modern JIT manufacturing environment for the automotive industry. A stamping operation shutting down due to backed-up scrap not only decreases production at the presses but also affects downstream operations in a cascade of cost and delay. In addition, an excessive buildup of scrap at the press can affect operator safety and place tools, dies and other equipment at risk. That’s why Cannon Automotive’s 65,000-sq.-ft. Bowling Green, KY, plant automates its scrap handling, in keeping with a highly automated stamping operation. Once steel coils are introduced to the feed line, personnel do not handle product until finished-parts bins transfer from the press area to shipping. To carry scrap from the presses and ensure that production-impairing scrap backups don’t occur, the plant employs Shuffle Drive conveyors from Press Room Techniques, Inc., Lindsay, Ontario, a subsidiary of Mayfran International Inc., Cleveland, OH. The conveyors, installed in September 2007, each have 24-in.-wide trays and rated capacities of 60,000 lb./hr., more than sufficient to handle the plant’s heavy scrap. 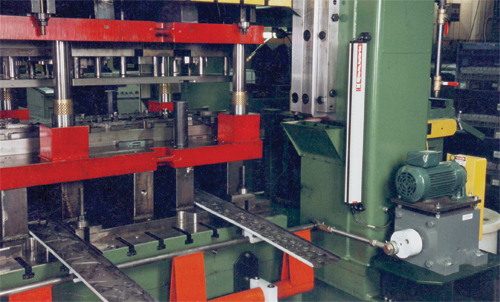 They serve four automated presses, ranging from 250 to 1750 tons producing parts in thicknesses from 0.020 to 0.280 in. A press-mounted Shuffle Drive replaces a traditional conveyor for part and scrap removal from the presses while a second Shuffle Drive conveyor, installed in a pit, delivers the scrap to an A-Pan steel-belt incline conveyor with a 36-in. width, also from Mayfran. The A-Pan design features an inverted angle on top of the steel belt to ensure optimal handling of the plant’s heavier scrap. 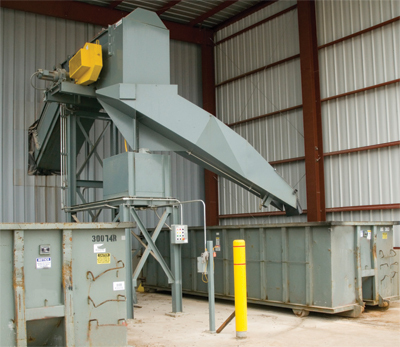 After transport through a below-floor conveyor, scrap is dropped into bins outside of the plant. This chute automatically swivels to empty into a second bin should the first bin become full. less affected than ultrasonic depth gauges—often used by conveyor manufacturers to determine scrap levels—by environmental conditions, especially important when scrap bins are located outside of the plant. With the Shuffle Drive, an electric motor moves a drive shaft on an output hub through a reciprocating motion. As the drive shaft accelerates, material on the conveyor tray is pushed forward several inches, where it remains while the shaft slowly returns to its original position, and then the cycle begins again. Thus the material, whether lightweight or heavy, shuffles its to its destination quickly and quietly, according to Pressroom Techniques officials. They also note that the simple conveyor design eases maintenance and promotes reliability. The direct-drive motor and shuffle drives mean no belts or chains to break or maintain, and the design incorporates few wear-prone pinch points that characterize many conventional conveyor designs. The nonvibratory system eliminates risk of damage to the floor-anchor system or the drive itself. Adding to reliability, according to Pressroom Techniques officials: Many parts are rated in excess of the system’s actual performance. For example, the drive unit’s bearings are rated for 25,000 hr. at 500 rpm while the unit actually operates at only 70 rpm. The under-floor Shuffle Drive has a slope of approximately 0.5 in./ft. over the length of the pit. Its design allows it to be installed in virtually any pit and be serviced in tight spaces, according to Mayfran officials. For example, drive units can be installed either above or below the trays depending on the needs of the application, and all of the system’s large fasteners have mechanical tensioning nuts. As a result, large wrenches, difficult to wield in tight spaces, are not required to tighten or loosen the nuts. The Shuffle Drives have been maintenance-free since their install, according to Cannon officials. The scrap-handling system also helps Cannon save on stamping lubricant. The slight incline of the pit system enables gravity, aided by an air knife, to push lubricant through holes drilled along the length of the tray and into a collection trough below. Cannon collects the used lubricant and filters it for reuse. Information for this article provided by Mayfran International, Cleveland, OH; tel. 440/461-4100; www.mayfran.com. See also: , Mayfran International, Inc.